When it rains it pours and that was the case in November last year. 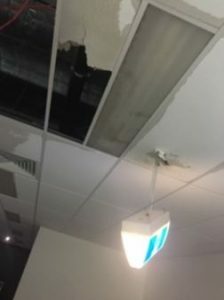 Having recently moved from North Sydney to Artarmon we had just finished the new office fit out when the heavens opened. Our Operations Manager arrived at work at 6:50am to find water coming under the front door. 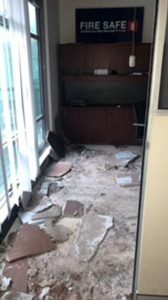 First on the scene she opened the door to discover the upstairs office roof had collapsed and it was raining inside. The mains power was immediately turned off at the switchboard and ironically, the only lighting we had were the exit and emergency lights. As more staff members braved the elements, by 8:00am it was all hands on deck to salvage the computers and office equipment to prevent any damage. 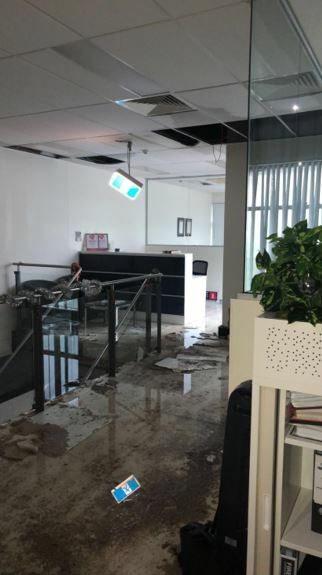 The whole Fire Safe team came together to mop up the 3 inches of water in the warehouse, remove the ceiling in the upstairs office and get us back up and running with as little disruption to our customers as possible. The office phones were diverted to a mobile number and we had set up a temporary office in the warehouse downstairs using laptops, tablets and mobile phones. 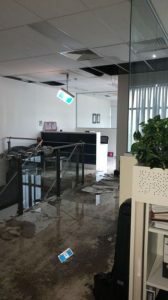 Despite it still raining outside and inside, by 9:00am it was business as normal, we were answering calls and emails and our customers were none the wiser of what had happened. After doing a full day of work in the field, our Senior Technician came in after hours to replace the RCD’s in the switchboard which had been damaged by the water and we had mains power back again by the end of the day. 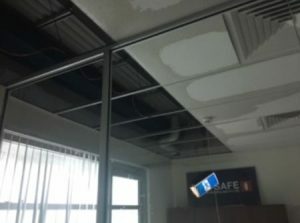 We were the only office in the Industrial Park back online so quickly and efficiently and that was down to great teamwork. Everyone went above and beyond to help out and a lot of hard work was involved in the clean up so after a long day it was finally time to put our (wet) feet up.